Spring onions have been grown for a long time – Egyptians grew them along the Nile during the time of the Pharaohs. 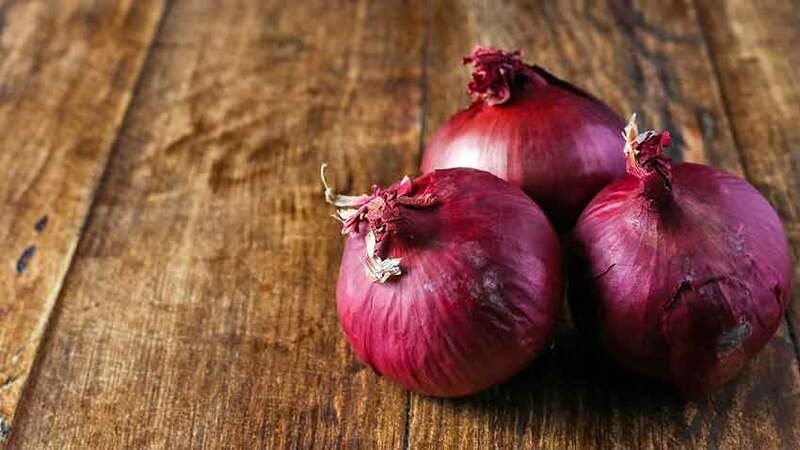 One of the easiest vegetables to grow, onions sometimes confuse home gardeners as to the best type for their garden. Onion seeds give the greatest choice but take the longest to grow – up to 100 to 130 days from sowing the seed. Transplants are simply young onions, like seedlings, grown to the scallion stage then bundled for sale. They grow faster but are the most expensive and fragile option as they are susceptible to transport and transplant shock. 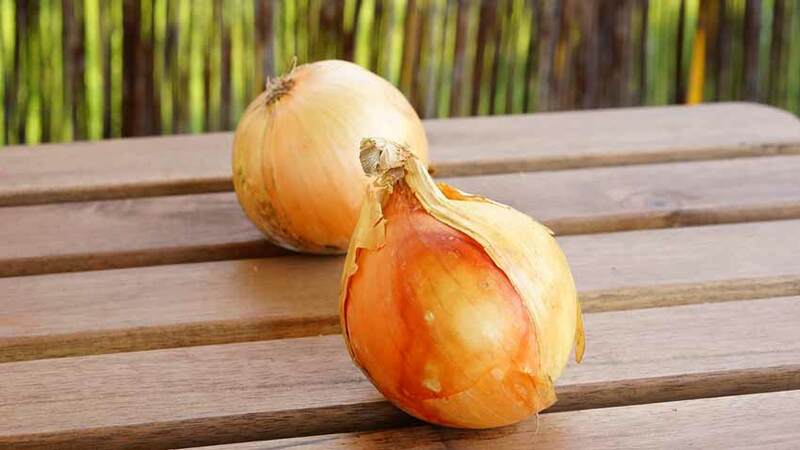 Bulbs are small, dormant onions grown from seed the previous season. They will grow to full-sized onions in about 2 months from planting. We recommend using onion bulbs, which can be planted without worry of frost damage and have a higher success rate than transplants. 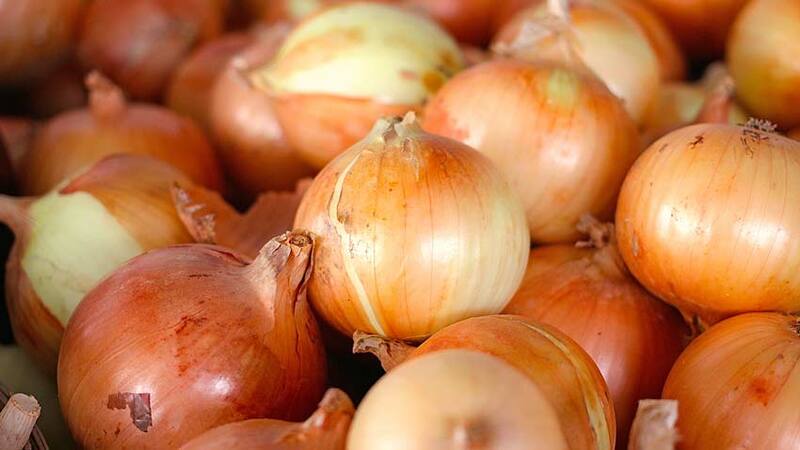 Bulbs are perfect for the home gardener as they guarantee onions for use or storage within a few weeks after planting. As a member of the allium family they are a natural pest repellant to most foraging animals in the home garden. Note: These details are for growing onion bulbs, not green or bunching onions. To grow green onions, simply plant the seeds and harvest when they are an appropriate size for your use! Spring onions are usually sorted by the amount of daylight hours they need to grow bulbs; these are known as day-neutral and long day onions. 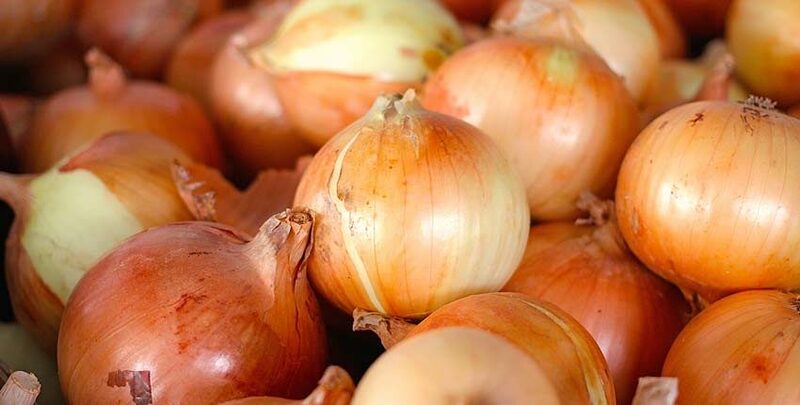 Day-neutral onions form good size bulbs with 12 – 14 hours of daylight, while long-day onions need 14 – 16 hours. 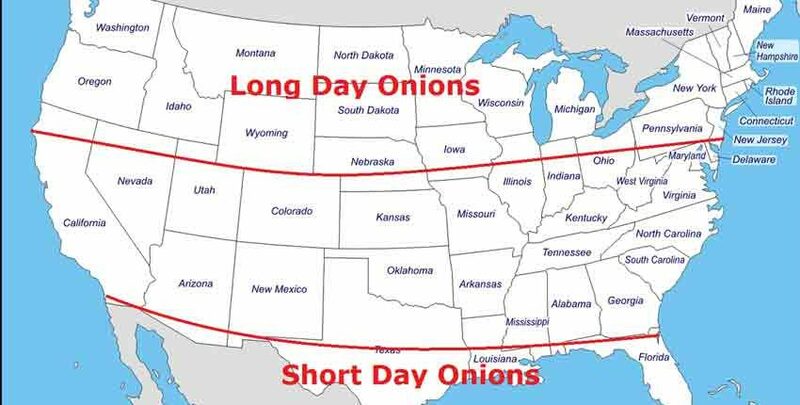 The map above shows the approximate latitudes where long-day onions need to be grown. 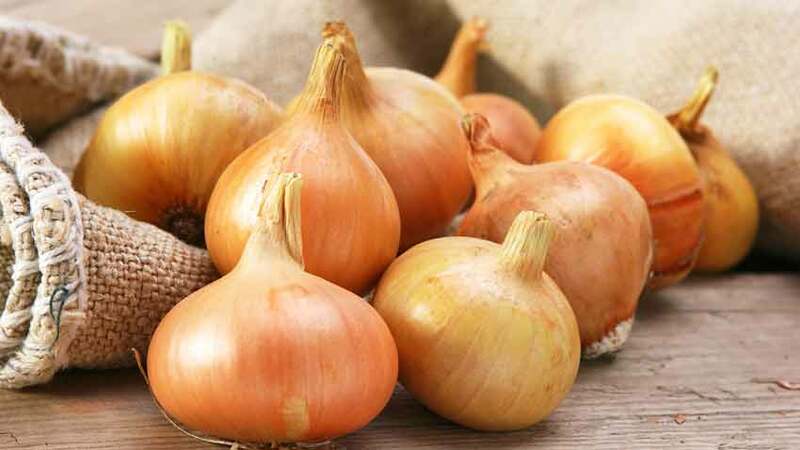 Day-neutral onions will also grow well in the more northern states in spring and summer. Day-neutral onions are usually sweeter and juicier than their long-day counterparts. 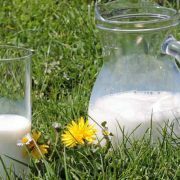 Their higher sugar and water content make them best suited for cooking and immediate use instead of storage. They are best planted from early spring to mid-summer in northern states and early spring to late fall in southern ones. Candy is our day-neutral onion, being adapted to a wide range of day-lengths from north Texas to Maine. 12 to 14 hours of daylight will produce a good bulb. These can be grown in Zones 5 to 9. Long-day onions are just the opposite with lower sugar and water content but higher sulphur, making them best for storage and cooking. These are planted in early spring in mid to northern states for fall harvest. 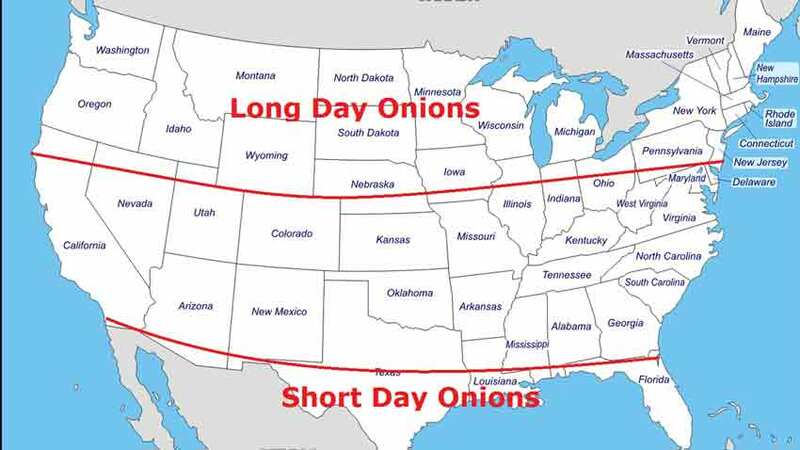 Growing long-day onions in the southern states will give small bulbs, more like scallions than full onions. 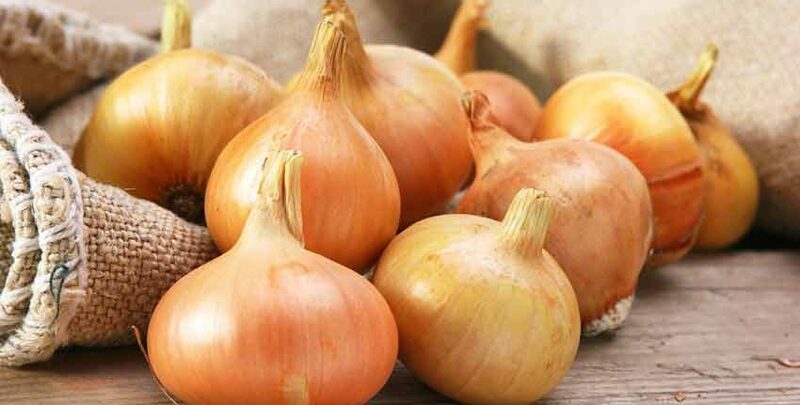 Our long-day selections include Yellow Stuttgarter (in the header photo), White Ebenezer and Red Wethersfield onions. They do best with 14 to 16 hours of daylight to form a good-sized bulb and are typically grown in colder winter areas. Zone 6 and colder is a good rule. Choose your onion bulbs here! Spring onions prefer abundant sun and well-prepared, healthy soil with good drainage. 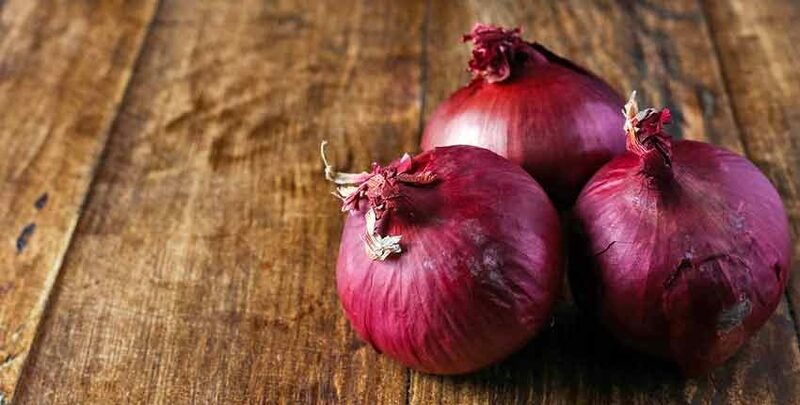 While onions will grow in nutrient poor soil, they won’t form good bulbs or taste as good. If possible, till in aged manure the fall before planting. Onions are heavy feeders and need constant nourishment to produce big bulbs. 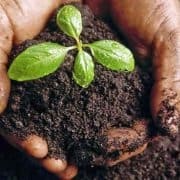 If needed, add a natural nitrogen source when planting, such as fish emulsion or aged compost. Plant onions as soon as the ground can be worked in the spring, usually March or April. Make sure overnight temperatures aren’t forecast to drop below 20°F. Plant the bulbs about an inch deep and four inches apart. Plant no more than one inch deep, otherwise bulb formation can be restricted. 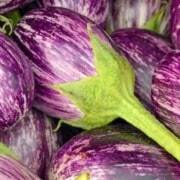 Feed every few weeks with nitrogen rich fish emulsion to get good sized bulbs. 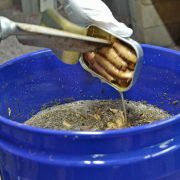 Synthetic nitrogen fertilizer will grow larger bulbs at the expense of flavor. 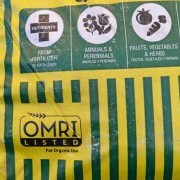 Stop fertilizing when the onion starts pushing the soil away and the bulbing process begins. Do not put the soil back around the onions; the bulb needs to emerge above the soil. Onions have short roots and need about an inch of water per week, including rain water to avoid stress from lack of moisture. Mature bulb sizes will be smaller if they do not receive enough water. Raised beds and rows are good growing locations. It is important to keep onion rows weed-free until they become well established. Mulching helps protect them from weeds competing for water, as well as preventing moisture loss from sun and wind. Spring onions are ready for harvest when the bulb has grown large and the green tops begins to brown and fall off. The plant should be pulled at this point, but handle them carefully as they bruise easily, and bruised onions will rot in storage. Onions need to be cured before storing. Cure them with their tops still attached, in a dry location with good air circulation – they can hang on a fence or over the railing on a porch to cure if there is no rain in the forecast. During curing the roots will shrivel and the tops will dry back sealing the onion and protect it from rot. 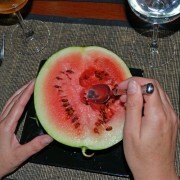 After 7 – 10 days clip the tops and roots with shears, then store them in a cool, dry environment or use for cooking. With a little experimenting and succession planting, you will find it easy enough to grow most of your own onions throughout the year. After tasting home-grown onions, you won’t want “store-bought” anymore!